In this photo taken on Friday, Jan. 15, 2016, a sign for an all-gender bathroom is displayed at the Naropa University Nalanda Campus in Boulder, Colo. As part of a broad reexamination of restrooms on its campuses, Naropa University has created two "all gender" bathrooms on the second floor of its Nalanda campus at 63rd Street and Arapahoe Avenue. 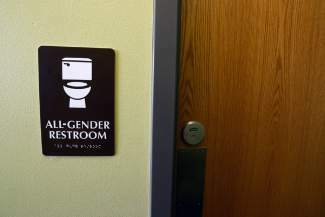 DENVER — As part of a broad re-examination of restrooms on its campuses, Naropa University has created two “all gender” bathrooms on the second floor of its Nalanda campus at 63rd Street and Arapahoe Avenue. This month, the Buddhist-inspired university converted a men’s room into a single-occupant, all-gender restroom and turned the corresponding women’s room into a multi-stall, all-gender restroom, said Todd Kilburn, Naropa’s chief financial officer. Signs now hang outside the two doors bearing the phrase “All-gender restroom,” with a toilet replacing the traditional stick-figure depiction of a male or female. The conversions came after a university committee identified restrooms as a place where students, faculty and staff may feel marginalized, said Debra Bopsie, interim director of diversity and inclusion. The phrase “gender binary” refers to the traditional classification of all people as either male or female, a notion that is being increasingly replaced by a more fluid understanding of gender. The changes at Nalanda, a building constructed in 1977 and purchased by Naropa in 2000, are the first step in the university’s larger conversation about restrooms. Bopsie said the university is in talks with students, faculty and staff about next steps, including whether to remove gender labels from all restrooms throughout the university. Diana Rodriguez, a freshman studying creative writing, said she appreciated the school’s changes at Nalanda and said it’s a step in the right direction toward making everyone feel comfortable. “I’ve seen a lot of students who struggle with which side they should go to the restroom at, and this eliminates the boundary they have,” she said. Freshman Sky Texier said he felt the restroom initiative represented the wider climate at Naropa, which is generally accepting and wants to create a “safe space” for all people, including those who don’t identify as male or female. “I do feel like that is a bit of a smaller community here, but that being said, that smaller community isn’t marginalized, they have a voice, these are things they care about and Naropa is very willing to help change,” he said. Along those lines, the school has been pushing students and employees to use a person’s preferred gender pronouns — he, she, they, etc. — if they are comfortable sharing their preferences. The school is also renovating a building on its Arapahoe campus to create a “cultural identity center” for members of traditionally underrepresented populations and their allies to gather, Bopsie said. “Naropa University is looking at all the ways that marginalized groups of people, particularly students, are harmed in any way,” she said.